January 25 marked the second annual Automotive Day at the Statehouse in Indianapolis. 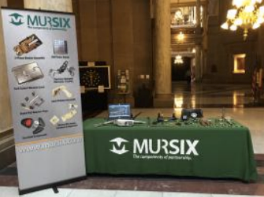 As a member of the Indiana Automotive Council, Mursix was invited to attend and represent our manufacturing capabilites to the top leaders of the big automotive companies. Representatives from Fiat Chrysler, Cummins, General Motors, Honda, Subaru and more were present. While this provided great potential for getting our name out as a leader in automotive manufacturing and one of the fastest growing companies in the state, we also had the opportunity to speak with legislators that represent districts throughout the state, and end with a meeting with newly elected Governor Holcomb. The hot item on the agenda was definitely workforce development and the need to get the word out to the community and in local middle and high schools that manufacturing drives the Indiana economy – there are plenty of jobs in this industry! There are over 111,850 Hoosiers employed in the auto industry alone, and over 500 automotive companies in Indiana with over $6.5 billion in auto wages paid. Since 2010 there has been over $7 billion in new auto investments and this industry has contributed $16.6 billion to Indiana’s economy. Our initiatives in the community are paramount to our success, and we will continue to put our effort toward the health and viability of Delaware and the surrounding counties.